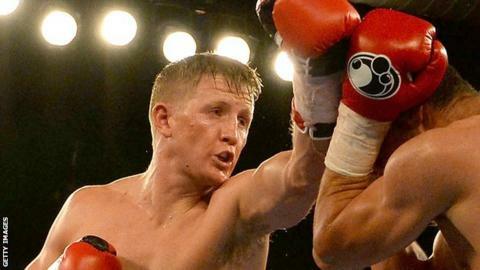 Sedgefield boxer Bradley Saunders says ongoing problems with his hands have forced him to consider retiring. Saunders lost his unbeaten professional record when he was disqualified for headbutting Renald Garrido last month during a bout in which he ruptured ligaments and tendons in both fists. The 29-year-old has previously had surgery and a sabbatical in a bid to correct the problem with his hands. "I'm going to talk to my manager and my family," Saunders told BBC Tees. "I will do what's best for me and my family. "I knew this was going to happen, I didn't think it would be this soon. I've been going in and out of hospital with hands all my boxing life and I'm at the point where I'm past caring. "I'm sick, I've never let anyone down but my body has let me down. "Some people won't even know the injuries I have, and the things I've been through because I thought I could be number one. I believe if I had two good hands I could go to the top but my body won't let me go that far." Since returning to the ring in July 2013 on the back of extensive treatment on a shattered hand suffered mid-fight in November 2012, Saunders saw off eight opponents and rose up the rankings to set up the Garrido fight. His disqualification during that light-welterweight bout in Liverpool was the consequence of frustration as his fragile hands failed to stand up to the punishment. "Long-distance runners have bad knees, I've got the same with hands, and when I was in there I didn't want to be there," Saunders added. "I sat down in the corner and I said, my hand has gone, and then in the fourth round my other hand went, it was like being a footballer with broken feet or a tennis player with no racquet. It was impossible."